*Package design and set details may change without notice. 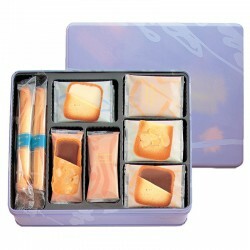 Assortment of five different types of confections. The Yoku Moku cookie is a delicate buttery confection made with all natural ingredients with no preservatives or additives. Made primarily of butter, sugar, egg whites, wheat flour, almond powder and vanilla, the Yoku Moku cookie literally melts in your mouth. Light and crunchy, the Yoku Moku cookies have several variations.